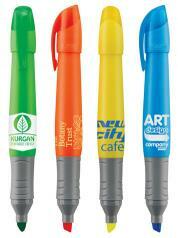 With your firm imprint or logo, our promotional highlighters and markers, make great promotional items. 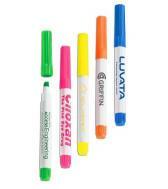 See our wide choice of highlighters and markers below. These items will make a big impression to promote your business by advertising with promotional products.. This means that everyone will see the highlighters and markers with your company imprint or logo, use them, and think of your firm when they need your product or business. It is also a great way to promote a specific event. Lowest price starting at: $0.53 each. 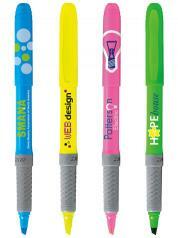 Description: Dri Mark Brand- Colorfull highlighter with large imprint area. Cap Trim matches highlighter color. Clear or White barrel with bright neon highlighters & smooth chisel tips that won't bleed through paper. Your best bet for everyday highlighting needs. Lowest price starting at: $0.54 each. Description: Silver barrel with vivid color accents. Ball point pen on one end. Highlighter on the other end. Twist action mechanism for pen. Medium point black refill in pen. Lowest price starting at: $1.08 each. Description: Large size makes it easy to hold on to. Extra large imprint area. Removable cap with clip. Lowest price starting at: $0.72 each. Description: *There is a 6 % surcharge for BIC pens shipped to California, Florida, Tennessee, Maryland and Wisconsin. *Thin and broad chisel tip. *Won't dry out, even if left uncapped for 7 days. *Textured, rubber grip. Lowest price starting at: $0.86 each. 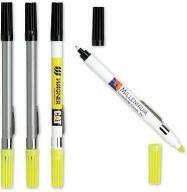 Description: A jumbo version of the Bic highlighter. Won't dry out, even if left uncapped for 7 days. *There is a 6 % surcharge for BIC pens shipped to California, Florida, Tennessee, Maryland and Wisconsin. Description: Five highlighters in one. Caps indicate color. Individually polybagged. Description: *Shipping is included in the price. *There is a 6 % surcharge for BIC pens shipped to California, Florida, Tennessee, Maryland and Wisconsin. *Writes on virtually any surface. *Large, multiple imprint areas. *Textured grip.